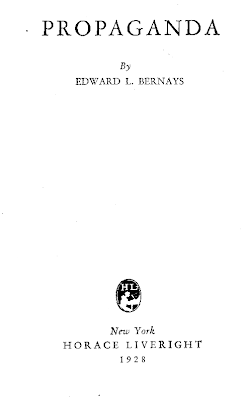 A seminal and controversial figure in the history of political thought and public relations, Edward Bernays, pioneered the scientific technique of shaping and manipulating public opinion, which he famously dubbed "engineering of consent." During World War I, he was an integral part of the U.S. Committee on Public Information (CPI), a powerful propaganda apparatus that was mobilized to package, advertise and sell the war to the American people as one that would "Make the World Safe for Democracy." The CPI would become the blueprint in which marketing strategies for future wars would be based upon. Edward Louis Bernays (November 22, 1891 – March 9, 1995) nephew of psychoanalyst Sigmund Freud, was considered the father of the field of public relations. Combining the ideas of Gustave LeBon and Wilfred Trotter on Crowd psychology with the Psychoanalytical ideas of his uncle, Sigmund Freud, Bernays was one of the first to attempt to manipulate public opinion using the psychology of the subconscious. He felt this manipulation was necessary in society, which he regarded as irrational and dangerous as a result of the 'herd instinct' that Trotter had described. This book, Propaganda by Edward L Bernays (1928), is mentioned clearly in this great article "Comfortably Numb"
This site is mentioned somewhere in the commentary section there as well. That's how i ever know about it and this blog. Just read the "Comfortably Numb", it's a great article!